The family mystery/adventure movie The Three Investigators in the Secret of Skeleton Island, concerning a trio of boy detectives, is based on the popular children’s book series that was first published in the U.S. in the 1960s under the banner of Alfred Hitchcock and the Three Investigators. There were 43 books in the original series, including the one on which this 2007 German/South African co-production is based. 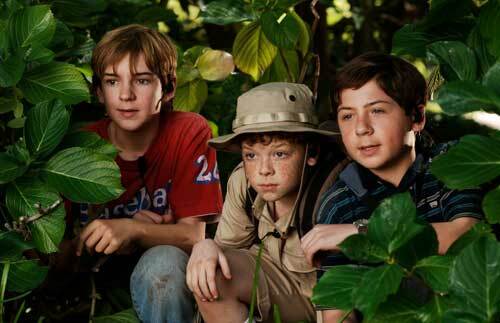 In the film, the adventure-seeking titular juveniles–Jupiter Jones (Chancellor Miller, TV’s Everybody Hates Chris), Pete Crenshaw (Nick Price, Because of Winn-Dixie) and Bob Andrews (Cameron Monaghan, Showtime’s Shameless)–follow an invitation to South Africa to unlock the secrets of Skeleton Island, which revolve around a mysterious beast whose origins may date back to the 17th century. Directed by Florian Baxmeyer, the movie was released in theaters in Europe back in 2007 but is premiering on DVD in the U.S. in 2011. Bonus features include a photo gallery and a trailer for the second film in the series, The Three Investigators in the Secret of Terror Castle.